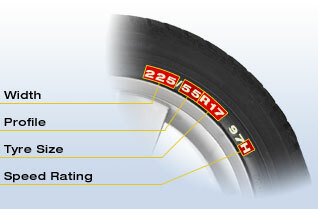 At Blackcircles.com, finding out the size of your tyre is easy and hassle free. For 100% accuracy the most effective method is to take a note of the tyres currently on your car. To help you with this you can print off this handy guide to keep you right. Although the letters and numbers may look complicated, when you have done it once you will never look back. If you would like some extra assistance then you can use our great new Quick Look tyre tools which will identify all the original sizes that came fitted to your model of car when it was fresh off the production line. You can either enter your registration number, vehicle make and model details or your known tyre size into one of the Quick Look tools below. Different Front and Rear sizes? Some vehicles are fitted with different sized tyres on the front and rear axles. If this is the case, please select your front tyres from the search tool and select "Find My Tyres". You can then add your selected tyres to the basket and come back to this search page to select the rear tyre size. Enter your car details below. Still having difficulty? Remember, our team are here to help.